UNIVERSITY PARK, Pa. – The No. 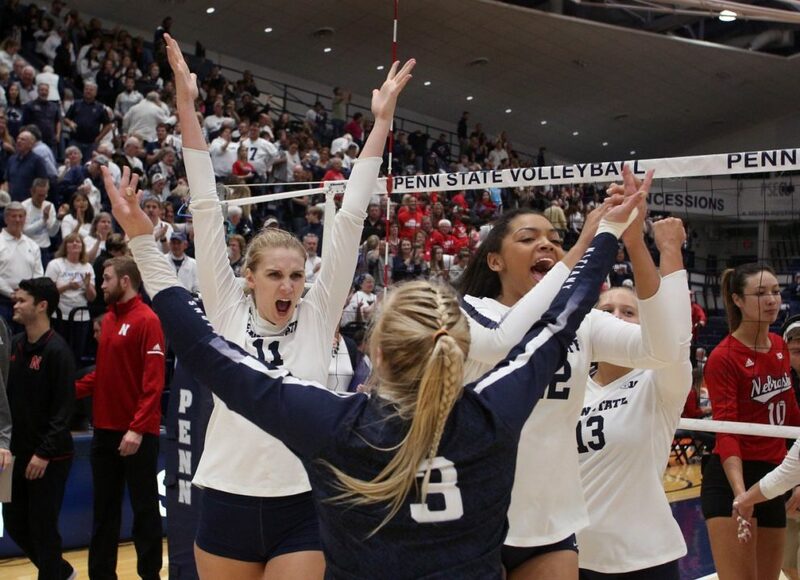 8 seed and seventh ranked Penn State women’s volleyball team advanced to the third round of the 2018 NCAA Volleyball Tournament with a 3-0: 25-13, 25-20, 25-16 sweep of the Orange of Syracuse on Saturday evening in Rec Hall. The win was the 100th NCAA Tournament win for the Penn State women’s volleyball program as well as the 100th career NCAA Tournament win for head coach Russ Rose, making him the first NCAA Division I coach to reach 100 NCAA Tournament wins. A league of his own. Penn State saw four players’ average double-digit kills led by redshirt junior Tori Gorrell, who finished with a season-high 11 kills on .500 hitting, and four blocks. Redshirt senior Nia Reed, graduate student Taylor Leath, and freshman Jonni Parker all added 10 kills. Parker added eight digs and two blocks, Reed added two blocks, and Leath tallied five digs, two blocks and an assist. Redshirt junior Bryanna Weiskircher finished the match with 43 assists, which was the most in three sets by a Nittany Lion this season. She also added seven digs, three blocks and three aces. Defensively, Kendall White continued to dominate the backcourt. The junior libero led the match with 14 digs, adding to her record-breaking season total of 531. The Nittany Lions held Syracuse to just .138 hitting on the match, and countered with 47 kills and a .290 hitting percentage. Penn State will await their next postseason destination as the No. 1 seed Stanford will play later Saturday evening and the Nittany Lions potential opponents will be determined between Washington and Creighton. UNIVERSITY PARK, Pa. – Following a historic 2018 season, the Syracuse volleyball team’s 2018 season came to a conclusion Saturday evening in the second round of the NCAA Tournament. The Orange (19-9, 14-4 ACC) dropped 3-0 to eight-seeded Penn State at Rec Hall. Syracuse’s 2018 season is highlighted by the program’s first appearance in the NCAA Tournament. The Orange made their tournament debut Friday evening where they swept Yale, 3-0. With a 19-9 record, the 2018 team ranks second in the country with 3.08 blocks per set. Picked to finish ninth in the preseason ACC poll, the Orange matched the program’s top conference finish ever in fourth. Polina Shemanova led the Orange with 10 kills, marking her 26th double-digit kill match of the season. Santita Ebangwese contributed six kills on 12 attacks while Ella Saada and Kendra Lukacs both added five.